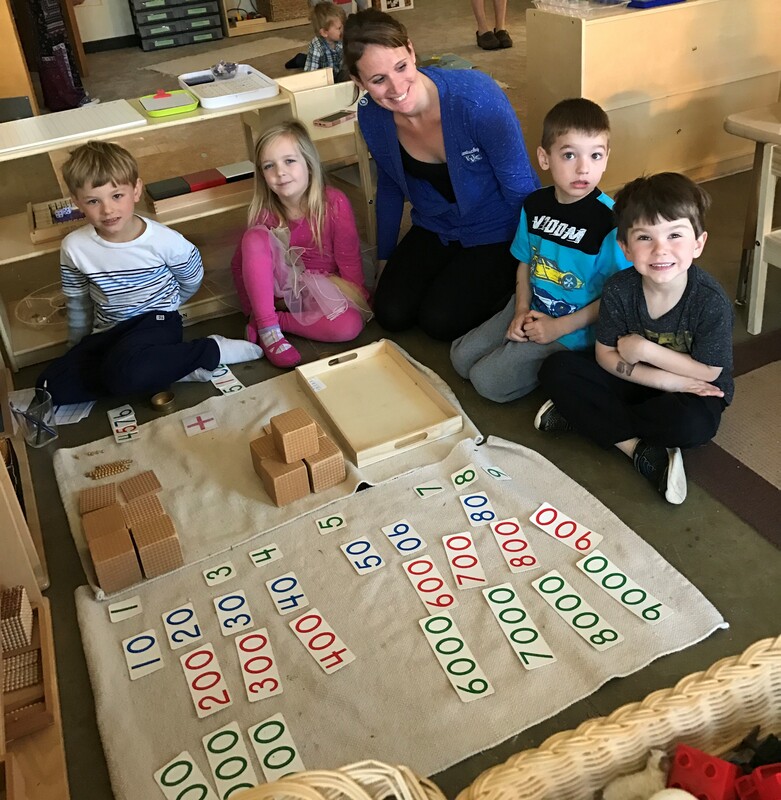 As a teacher in a Montessori 3-6 year old class and later as an administrator, I have personally witnessed the benefits children reap when given the opportunity to remain in the 3-6 year old class for their Kindergarten year. Many parents fear that their child will be at a disadvantage being one of the oldest in the class – that mixed age grouping is only beneficial for the younger children in the group. In reality, there are benefits for both the youngest and the oldest. The 5 year olds have probably been in the same class for one or two years prior to their Kindergarten year. There is no need to spend time at the beginning of the year assessing the Kindergarteners to determine where they are academically. They are the “seniors”. In addition to where they are academically, they know the routine, the classroom ground rules, the layout of the classroom, where each lesson belongs on the shelves, playground rules, their own teachers and probably most of the school staff. They become the classroom leaders when they stay for their 3rd year as a Kindergartener. They are able to help a new child who is having difficulty separating, be the one to assist a younger child who is struggling with a lesson, help straighten the classroom at the end of the day, clean up a spill, or comfort a crying child. They develop leadership skills that will remain with them for a lifetime. At circle time they are the ones who know the days of the week and the months of the year when reviewing the calendar each day. They can demonstrate how to roll a rug, walk around a rug, push in a chair, carry a lesson with two hands, wash their hands, raise their hands and sit properly in a group. The Kindergarteners are the role models and mentors and have a unique opportunity to contribute in that capacity. As role models, mentors and helpers, their self-esteem and self-confidence soar. This is particularly beneficial if a child is the youngest in the family, or an only child, as it allows them to be the oldest for part of their day. There are many opportunities throughout the school year for the older children to help younger children. This solidifies their own learning; you can be confident that you really know and understand something if you can teach it to someone else. In addition to the social/emotional benefits, the children who stay for Kindergarten make great gains academically. In keeping with the Montessori philosophy, children progress at their own pace and have lessons presented to them based on their readiness, not on their age. To accommodate children who are ready for challenges that go beyond a typical Kindergarten curriculum, the classroom includes advanced lessons that may be considered first grade level work. In language, if a child has mastered phonics as a four year old, they will likely be emergent readers in Kindergarten. They can learn to read at their own pace, neither held up as they wait for others to catch up nor pressured to keep up with a more advanced classmate. In addition to continuing to improve their reading skills, children can start to learn about verbs, nouns, articles, etc. Punctuation, capitalization, handwriting, creative writing, reading comprehension can all be introduced when a child is ready. In math, a child may have learned addition using the golden bead material (units, tens, hundreds, and thousands) as a four year old, putting small numbers together to make one large number. The concept of addition is taught first so they understand numbers and number operations – it is not just memorizing math facts. Once they have mastered addition, they use the golden beads to learn to exchange 10 units for one ten bar, ten 10 bars for 100 and ten 100 squares for 1000. All this is taught using hands-on, concrete math materials that lead towards abstraction so they can eventually understand what it means to say 3+4=7. When a child is ready, he can go back to the concrete golden beads to learn concepts of multiplication, subtraction and even division. Beyond math and language, they can delve more deeply into geography, science and art. The 5 year olds still love the practical life area so lessons are available to challenge them. For example, instead of practicing their pouring skills using cups and glasses, they can pour into test tubes. Children who leave a Montessori program to enter a traditional Kindergarten program are often more advanced than their peers. The same may be true if they leave a Montessori program after Kindergarten to go into first grade. However, the discrepancy in readiness in Kindergarten is generally greater than in first grade. While most children now have some pre-school experience, some don’t or they come from a day-care vs. a school setting so there tends to be a wide range of school readiness in Kindergarten ranging from children who are still learning their letters and 0-9 numbers to children who are reading and understand math concepts. Children catch up in Kindergarten so by the time they enter first grade their skills are more aligned with their peers, leaving less of a readiness range in first grade vs. Kindergarten. Montessori Kindergarten provides an enriched academic program that goes beyond what one might expect in Kindergarten. Perhaps more importantly, the Kindergarten children become leaders, mentors and role models so they enter first grade with self-confidence and a love of learning.